Piešťany is mentioned by doctor Grünstein when he informs Švejk that healing his rheumatism here at the military hospital here (in Prague) would be much quicker than at Piešťany. Piešťany is a spa in western Slovakia known for its treatment of rheumatism. Until 1920 it was part of Hungary, like the rest of Slovakia. 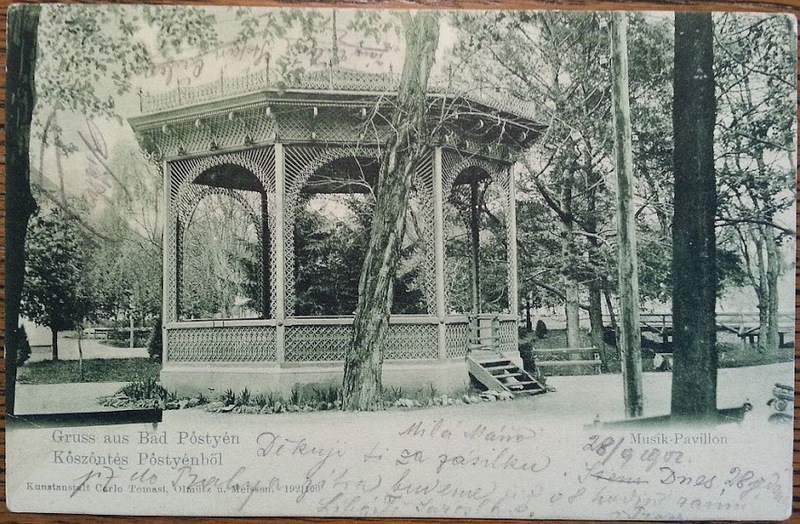 Jaroslav Hašek visited the place himself; on 28 September 1902 he sent a post-card from here to his cousin Marie. He was here together with Viktor Janota, Ján Čulen and Štefan Čulen. Hradčany is where the plot in this and the next chapter takes place. Švejk is first placed in the sick-bay of Posádková věznice to get a cure for his rheumatism, thereafter locked up in the very prison, suspected of malingering. Švejk also appears in other places at Hardčany: Vojenský soud, Vězeňské kaple and probably Vojenská nemocnice Hradčany. Hradčany is a cadastral district in Prague which includes the castle area. This is where the offices of the president, St.Vitus Cathedral and many other famous buildings are located. Hradčany is situated on a hill west of the Vltava and borders Dejvice, Strahov and Malá Strana. In 1914 the district was equivalent to Praha IV. [1.8] Konečně poptávkou na policejním ředitelství zjištěno bylo, že to byl Švejk, a dále bylo už lehké pátrat. Baronka von Botzenheim vzala s sebou společnici a komorníka s košem a jeli na Hradčany. Siam is mentioned indirectly through the term Siam elephant, used as a word of abuse against Švejk. See Vojenská nemocnice Hradčany. Siam is the former name of Thailand or roughly the area that corresponds to the modern state. Siam was never colonised but lost some territory to European imperial powers in the 19th century. The capital was always Bangkok. The term Siam elephant mostly refers to white (albino) animals that were regarded as holy. It was even on the flag of Siam until 1916. Thus Siam elephant is not an animal breed.